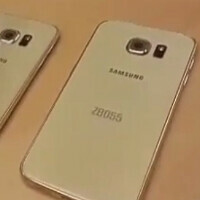 As usual, somebody couldn't wait a few hours, and has leaked the Galaxy S6 and Galaxy S6 Edge on video mere hours before the official unveiling. The culprit in question seems to have posted the footage below on the Russian social network VKontakte, and shows us the two new Samsung phones in all their glory. You can see the curved display of the Edge, and how it will sit in your hand, as well as how thin and light the handsets are actually, looking very solid in the palm. Moreover, they look shiny, and made of premium materials, so there might indeed be some merit to the rumors that the S6 and S6 Edge will arrive with metal frame, and possibly a glass back, judging from all the shine in the video below. Nice!, but haters will hate. You need to have your eyes checked. Well, it's not that ugly. The most important thing is it captures the best image among other smartphones. Each Samsung flagship ALWAYS lands on the top of the leaderboard in camera performance. GS4, Note 3, GS5, Note 4, and S5/Edge will be no different. History repeats itself. EXACTLY. The six months older iPhone6 will wipe the floor with SGS6, just like iPhone5s did with SGS5 last year. Ironically, iPhone6s will relieve SGS6 from that misery - by replacing iPhone6. Then Sammy has an excuse at least: iPhone6s is newer. Uhuh, the Note 4 that was announced right before the iPhone 6 and 6 Plus, already wiped the floor with the latter 2 in terms of camera output. So keep dreaming. Damnnnnn. This is dead gorgeous!! Black will look a lot better. Black is always better with glass. Looking forward to the black version! are you planning on getting it? Absolutely beautiful! Can't wait to get mine! A poor, blind, brainwashed soul, enslaved by Sammy. He's just a Samsung Fan. Why hate? I don't hate him, but commiserate him. He sounds like a child whose parents work at Sammy. It definitely the greatest phone of the year! S3, S4, S5. All protruding but in the middle.